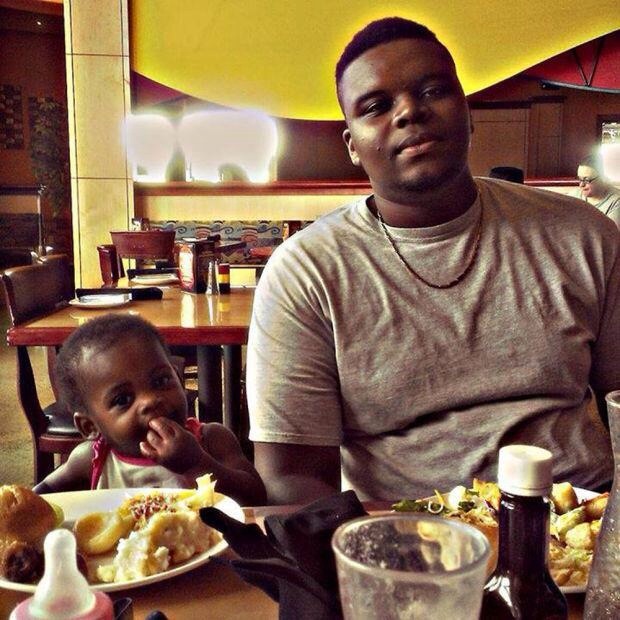 Iceberg Boys: On Michael Brown and Other Lives Cut Short. What struck me was how old they all looked, those boys with the full-grown beards and sculpted biceps, all between 16 and 18, dawdling in front of the schoolhouse before the homeroom bell. I wouldn’t be 14 for a few months and middle school, that hotbed of hormonal awkwardness, had done nothing to prepare me for sauntering through an every-morning gauntlet of upperclassmen. I don’t often remember high school fondly, but when I do, I recollect walking up to mine that first morning. I recall the thrill of suddenly sharing space with so many of these manchildren and the heady unexpectedness of their appearance. They were boys goofy enough to still prank and preen and bluster for young girls’ attention while toiling at manual labor jobs on weekends or closing restaurants at midnight on weekdays, before driving home in rustbucket cars they’d purchased themselves or sedans their parents were leasing. There was such a chasm, both of responsibility and experience, between those boys and me. On that first day of high school, I fell in love at least three times before class was dismissed. Honey, here is a thing you will need to know about young black men: they are icebergs. My lord, how often they’ve been told to shine up the peak that is exposed, how thoroughly they’ve convinced themselves that what lies beneath should stay submerged. The waters are dark and frigid, but when you love any one of those iceberg boys, you will want to plumb his depths. You will long to warm him enough to lift him, to lower the water levels, to expose the many moments that he feels the need to hide. And if you succeed, what you will surely find first is fear. The footage is grainy and so am I. Days of following this case have made me feel less like a fully composed person and more like a loose collection of snowy particles threatening to drift apart, if it weren’t for the casing of my skin. What the footage shows is two young men in a convenience store. It shows them taking cigarillos from the store as the cashier tries futilely to stop them. The aggressor looms nearly a foot taller than the store clerk. He shoves him then doubles back and uses his size to keep the cashier cowering while he leaves. Yesterday morning, at a press conference that promised the name of the officer who killed Michael Brown, a police chief whose job performance I’ve grown to despise over the course of this week took the podium and said, “What we’ll be releasing today are details about a ‘strong-arm robbery. '” He presented a timeline of the robbery, insisted he would not take any questions, then proceeded to turn away from the mic. Journalists and protesters erupted. WHAT IS THE OFFICER’S NAME? they cried. 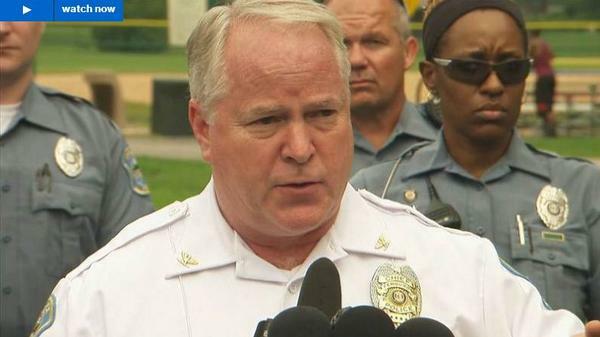 Ferguson Police Chief Thomas Jackson turned and stammered the shooter’s name, as though a bit taken aback that he was being asked to offer it at all. He spelled it. He emphasized the cop’s clean six-year record. And then he walked away. Within seconds, screen shots of the young men in the convenience store were online. Within minutes, the full surveillance video clip was released. Within a half-hour, my social media timeline reluctantly noted the similarities between the bullying aggressor in the video and the boy whose body had lain bloody in the street for hours last Saturday. By afternoon, Chief Jackson was back on television, admitting that the convenience store theft was not connected to Officer Wilson first stopping, then murdering, Mike Brown. It took six days for the police to produce this footage. Six days to even mention that Brown may have been involved in a robbery. Six days of the Ferguson Police Department protecting the name of their officer, who shot Brown in a completely unrelated incident. Five days of terrorizing a largely peaceful community, of meeting their placards, convictions, open palms and protest cries with tanks and tear gas and rubber bullets and peppershots and tanks and sniper-mounted rifles and wooden baton pucks. One day of relative peace, after a governor materializes — following a half-week of silence– and appoints a changing of the law enforcement guard. Seven days without public condolence or remorse. You have to learn quickly how to read an iceberg boy. Intuit which scents may mean trouble (weed, liquor, and — to the extent that it can sniffed at all — the tang of coursing testosterone, commingling a surge of adrenaline). Sense which sudden movements are harmless and which may connote a palpable menace. If you are wise, you know that none of an iceberg boy’s characteristics are mutually exclusive. He can be both the college-bound teen and the thief. He can be an inductee of the National Honor Society and the type of person who watches or records an assault and helps the video go viral. He can be innocent in one context and quite guilty in the next. Iceberg boys are not alone in that. So many of us know what it is to perform one identity for a parent and a far different one for a peer. So many of us know the shock that can come from a collision of those identities. Mike-Mike the Gentle Giant may also be Big Mike who shoves a trembling cashier and steals a box of Swisher Sweets. Neither deserved to be executed for refusing to step onto a sidewalk. Neither deserved to be executed for stealing cigarillos. The heartbreak here isn’t that the Mike Brown whose humanity we’ve championed in death may have been capable of intense contradiction in life. The heartbreak is that the police department responsible for his death wants to make that facet of his humanness a justification for his murder. The heartbreak is that cigarillo theft pales in comparison to the theft of any opportunity to become the man he might’ve been. The iceberg boys at my Baltimore County high school seemed desperate to represent some notorious Baltimore City set. They claimed connections to McCulloh Homes or Edmondson Village while living in quiet cul de sacs or sleepy clusters of prefab townhomes. They would tell us: I’ll be lucky if I make it to 25, even as they filled out college applications or consulted the guidance counselor for career options. I thought they were exaggerating. I thought they were being a bit ridiculous. I smirked and rolled my eyes. Not everyone black in ’90s Baltimore was living out his own personal Juice, Menace II Society, or Boyz in the Hood. But iceberg boys do die in suburbs. They really could be swarmed by multiple cop cars in routine traffic stops. They actually are assaulted by officers while they are subdued, nonresistant, and unarmed. I learned — and Daughter, I am sure you will, too — that, as long as we are black, where we live will never insulate us from harm. What those iceberg boys understood even in our predominantly black and middle-class community, was that black skin is a risk, wherever you are, and that living in this skin is its own contradiction, personal behavior notwithstanding. Our skin is at once a particular point of pride and also akin to walking out our lives cloaked within what may someday be our untimely-death shroud. A lot of the iceberg boys I knew in high school lived. The one whose backpack unleashed a contact high whenever unzipped finished grad school last year and is engaged to be married. One is in real estate. One is a minister. Another became a chef. Some are teachers. Many are fathers of college-bound daughters. Others are parenting iceberg boys of their own. I am sure that any of them would tell you it was hard being mistaken for men when they were still reasoning like little boys. I am sure that any of them would tell you they are both glad and relieved that they’ve survived.